It’s been harder than I thought getting around to putting my thoughts down. Maybe I didn’t want to have to think about it. Even writing now is difficult. How can one convey how one truly feels about the tragedy of losing a child. If that makes sense? I suppose some find it easier than others. Well here is our story… Mari and I are together since 2005. In 2011 we became pregnant on our second child our daughter Maite. Everything was going well with the pregnancy well at least that’s what we thought. It was not until the 22 week scan that we received the terrible news that something was going wrong with the pregnancy. I remember the day like it was yesterday. On the morning of the scan, we were excited and happy. We had to travel to Naas hospital where the Coombe have a clinic. I remember the expression on the midwife’s face change from one of happiness to sorrow. “I’m sorry to have to tell you this but the pregnancy doesn’t seem to be developing as it should. You will have to travel to the Coombe for more tests. Both Maria and I were in shock. It was not what we were expecting to hear. So we travelled to the Coombe straight away, first dropping our son Asier who was 2 at the time with my parents. “Don’t worry” they said, “everything will be ok, we will say a prayer”. Luckily when we arrived at the Coombe we were seen to by a lovely, extremely compassionate doctor, one of the Coombe Hospital’s top consultants. Sadly though Dr Martin could only confirm what the Midwife had told us. The pregnancy had not developed as it should and that due to some abnormalities with the babies organs chances of surviving or even for the pregnancy to go full term were zero. This came as a huge shock again to Mari and I. I suppose despite hearing the news earlier in the day we still clung on to the hope that her diagnosis was wrong, Doctors can get it wrong! I remember we were given some time to console ourselves. A short time later Dr Martin explained to us our options including that of a termination. She advised us that we didn’t have long if that is what we chose to do. I immediately said that was not an option for me. Sadly I had to go through the trauma of abortion with a previous partner when I was 22yrs of age and as a consequence was fully aware of the effects this had had on not only my ex partner but on myself also. To this day we are both affected. There was no way I was going through that again, or allow my wife to have to go through that either. So we chose to go full term with the pregnancy still clinging to the hope that the doctors had got it wrong. Unfortunately after some more tests we were told that our baby had a chromosomal Disorder called Trisomy 16 and that she would not survive. In most cases babies with this disorder do not survive the first trimester. But our little angel survived for 36 weeks. During this time we sang songs and spoke to her, urging her to keep fighting. We did this until the day of her birth. For me, it meant a lot to at least give her a fighting chance. It was always in the back of my mind that “what if the doctors had it wrong” I knew if we had chosen to abort, we would never had forgiven ourselves and the “what if” would always stay with us. 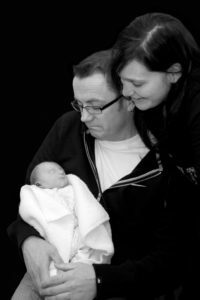 When Maite finally arrived, so sad as it was, the memories of seeing and holding our little daughter we will cherish forever. Maite survived, contrary to the norm for an hour after birth. I truly believe we made the right decision and that it has helped us through the trauma. We gave her a soul. As Joe mentioned it was difficult for me. How can you deal with the fact that the little life that it is inside you won’t survive after the birth? I have loads of mixed feelings. In Spain (where I’m from) doctors don’t give you a choice of keeping the baby in similar cases. They would just terminate. When our doctor suggested the abortion I wanted to know what it would involve as I’ve never been in favour but I was scared, very hurt by the news. When she explained to me that I would have to go to England and that they would give me an injection that would stop the heart of the baby in that instant I realised then what having an abortion meant. I know today I made the right decision. Maite was my little miracle. I should’ve miscarried at 12 weeks but instead I gave birth to a beautiful baby girl at 36 weeks. I was able to hold her, dress her, give her some love. She met her grandparents we gave her a name as she was baptised. I grieved properly and I know that she is with other little babies,her friends. Doctors and staff in the Coombe were amazing, they are prepared for the cases and they give you all the help to cherish these little moments. I gave my little Maite the chance to live. After the birth of Maite the support and care we got was amazing. Two special ladies help us through the passing of Maite. Pastor Reene was wonderful not only immediately after Maite’s birth but also helped us with the burial arrangements of our daughter. Also Brid, who is the counsellor at the Coombe, listen to our pain and help us through our grief at the time. Both women truly amazing people. Thanks for taking the time to care and read this, we hope our story can help others in similar situations.